Welcome to Spring here on my side of the world! It’s time for flowers to bloom, baby chicks to hatch, sunny skies, and…er…hayfever. So while I’m sniffing and nose-blowing at my place, here’s something to take us on to a new era in bookclub. * Title Selection: After long consideration, I’ve decided to change the title selection process for bookclub. The current system allows the authors of the month’s title to select the upcoming title. This was making it a bit tricky for me to plan and contact prospective authors in advance. So from now on, I’ll be selecting the titles every month, cos I’m bossy like that, with the occasional guest selector popping in to choose. I do solemnly swear I’ll make sure the titles we read are varied and diverse. If you have a recommended title that you’d really like to read over the next few months, let me know in the comments thread here or on FB. * Posts: The group will still be blocked to author/review blogger posts and book promotion posts. * Posts MkII: On the upside, all bookclubbers are heartily welcome to post up recommended reads, keep us updated about cool books you’ve come across, and add links for book events and book news. Did you know, for example, that Fleur Ferris’s book Risk won the 2016 Sisters in Crime Davitt Awards for YA? Now you know 🙂 So go nuts – let us know about your fave reads, your library author talks, your #LoveOzYA news, and more. * Reviews: Usually I include a review from an impartial reviewer (ie. not a bookseller or publisher, or myself) in the discussion post for each month’s book, to kick off discussion. I would like to float the idea that someone from the group could provide a review of the month’s title. So at the start of the month, in the title selection post, I’ll be asking for people to put their hands up. If you would like to review a book for the discussion post, please let me know in the FB thread or in the comments on the title selection blog post – see example below! Reviewers who put their hands up first will be chosen. If a bookclubber isn’t available to review, then I’ll chuck in a review from a third party. * Book Swaps: If you’ve bought a book and would now like to pass it on, you can let people know about book swaps here. All transactions after that point should be via DM, and are the responsibility of the group members involved. This is only open for books that have been read in bookclub – no posting of massive stacks of books for swap/sale please, and no ARCs, lest I delete thee. * Discussion comments/rating system: Bookclubbers are encouraged to add comments about the month’s title on the discussion thread on FB or leave a comment on the blogpost. BUT if you find a wordy comment hard, then you can also give a star rating out of five. For example: ‘I give ILLUMINAE five! Five twinkly stars! !’ etc. * Q&A: Although I like the idea of asking authors questions during the month, I think it may be impractical, so I will try my darndest to arrange more FB author chats, as those things are way fun. And that’s it! I’m giving away the two prizes now – the winner of a copy of this month’s title is Cecile Shanahan for providing the most useful suggestion, and the winner of the American edition of Every Breath for answering my questions most thoroughly is Jayne Muir. Winners, I will DM you to arrange sending out your prizes. Thank you for playing and congrats to all! 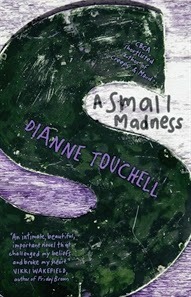 This month’s title was chosen by Ali Cobby Eckermann under the old selection system, so I’m very pleased to announce that the September title for #LoveOzYAbookclub is A SMALL MADNESS by Dianne Touchell. If you’d like to review this book for the end-of-the-month discussion post, please let me know in the FB thread for this post, or in the comments here. First bookclubber to put their hand up gets it. Dianne has already been in touch with me, and returned her Five Questions Q&A, so we won’t be having an FB chat this month. But I will endeavour to make a chat happen next month (for a book that I think you will all love. I have plans, cunning plans, oh yes…). Remember that our arrangement with Boomerang Books still stands, so if you would like to order the book through them, just quote the ‘loveoz’ code at the ‘enter promotional code’ stage to receive free shipping. I hope you enjoy A SMALL MADNESS, see you on the FB group page and have a very lovely bookish September!